HOLY FREAKING CRAP. Have you seen what Ink Sweets is capable of doing? Only making some of the most stop. in your. tracks. kind of desserts that not only look like a GD WORK OF ART but taste like one too? Tell us a little bit about yourself and how you got started as Ink Sweets? A little bit about me? Let’s see.. I love cheeseburgers, tattoos, The Breakfast Club, bourbon, and puppies. And, that about sums me up! Ok, so maybe there is a little bit more. But in all seriousness I was an artistic kid to say the least. I always had a marker or colored pencil in hand and was doodling somewhere on something (sorry, mom!) Growing up being artistic you’re always trying to find new ways to play around and cakes always seemed like such a fun medium. It’s definitely not a common hobby but I started doing it for fun when I was younger and it just became something I loved! Through my love of cake INK was born. Have you always known this is what you wanted to do? What gave you the inspiration to start baking? What about those beautiful tattoos! Which was your first one and when did you get it? You have quite a few, if you had to choose, which would be your absolute favorite? Ah, yes. The tattoos! I got my first tattoo when I was 17 and that is probably the most meaningful one I have. To someone else it probably looks like a weird, abstract shape thingy. But it’s actually something that I designed that incorporates all of my family’s initials into one line drawing. Depending on which way you’re looking at it you can see the different initials. It’s truly special. The rest of my tattoos are of fun baked goods & cakes! 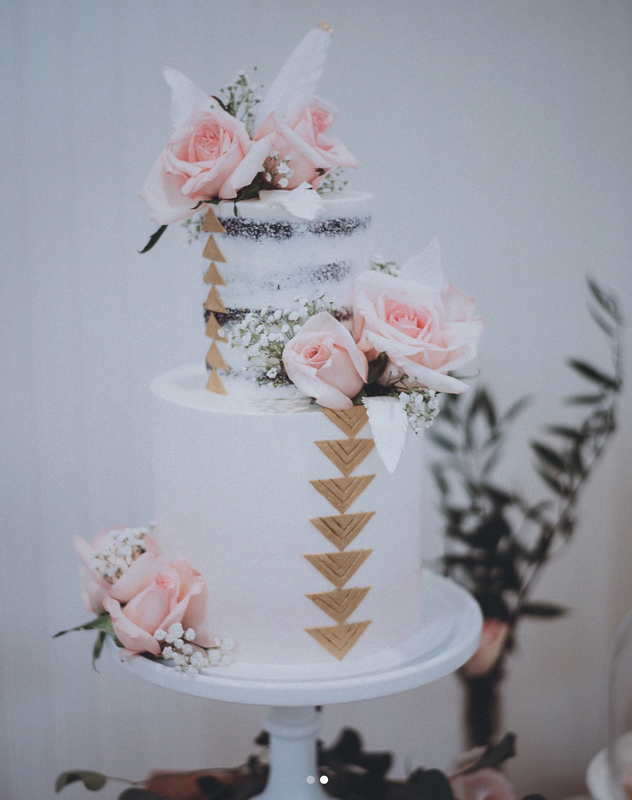 What is the process for clients to choose their wedding cake when they are booking with you? Well, I wouldn’t necessarily use the term “choose” their wedding cake, because that’s not what I’m about. Some brides & grooms don’t like to hear me say this, but I think it needs to be said so here it goes. 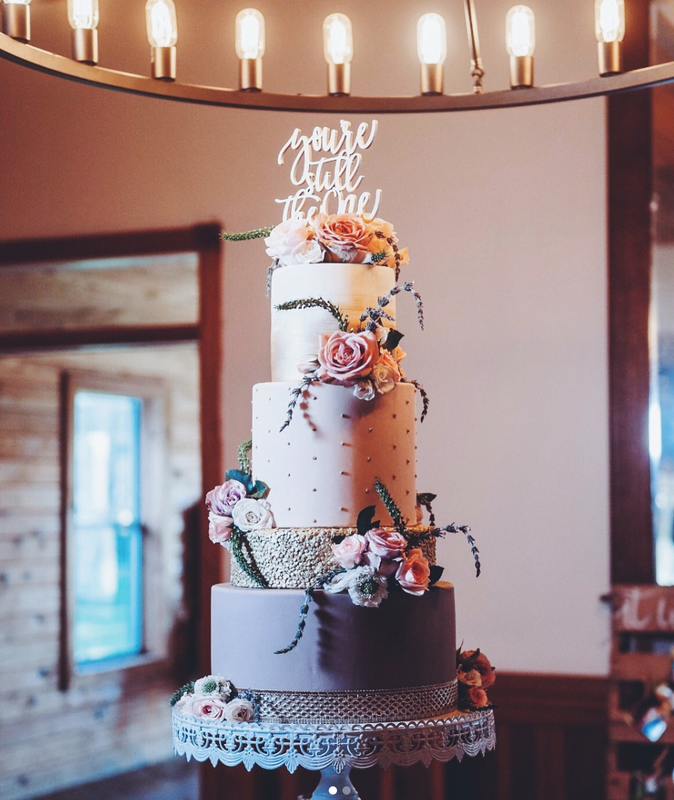 Please, Do NOT bring me a picture you found on Pinterest and say “I want this cake.” That is the quickest way to upset the person making your wedding cake. We take our craft very seriously. I mean we REALLY love what we do because of the freedom we have to create unique pieces for each and every couple! So telling us you want a cake that already exists is boring. Challenge us! We want to create amazing pieces that will wow your guests and create a magical moment for you. So my process is simple. I meet you, let you eat some cake, I pay attention to your energy, your style, the way you speak, the way you carry yourself, I learn about your likes, dislikes, fears, and desires for your big day and I take all of that and I just sketch. I will sketch until the lightbulb goes off and it just makes sense. Everything, design wise, will fall into place. It always does! How would you describe you creations overall? Would you say you have a consistent style for your cakes? Do you often try new baking methods and cake styles? I don’t think at this point in my career I necessarily have a recognizable “style” and it’s something that I think about a lot. 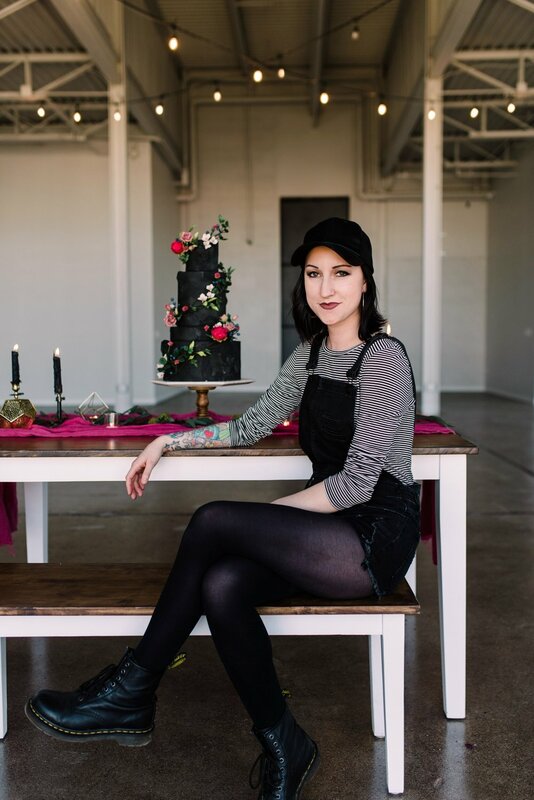 Some of my favorite cake decorators that I look up to like Maggie Austin and Jasmine at Jasmine Rae Cakes have this “thing” and you KNOW it’s theirs. It’s a beautiful thing to see and it’s incredibly inspiring. I got to meet Jasmine at a workshop recently in Seattle and she was telling me how she created her signature style by accident! I think I’m still very young and finding my voice as a cake artist and I think that finding that voice just takes time and a lot of experimentation. So, yes! I am always trying new things and pushing myself outside my comfort zone. You really seem to give your creations to life. Can you give us a little insight on how you come up with what to make and how you create the decor? It’s going to sound cliche, but I just let my creativity take me where it will. I try not to overthink when designing cakes and feel that less can be so much more. I am a big fan of more simple patterns on cakes (don’t get me started on my love of polka & swiss dots!) so that the decor can really shine. I am a big fan of sugar flowers and think it’s definitely something I excel at and I love to let that work do the talking as well. Tell us about how you source your ingredients, and what you think some of the most interesting ingredients that you use are! Ingredients are so, SO important! I try to buy local and organic when possible (seasonality can be an issue) and I think the biggest point I would like to bring up is that I only use unbleached flour. Did you know that the bleaching process of flour not only takes out natural nutrients found in the wheat, but also adds a whole mess of disgusting chemicals? GROSS! I’m not trying to give my clients cancer. I also currently use Valhrona chocolate & cocoa also because, YUM. Vanilla beans are another ingredient that I love. Are the expensive? Yes. Are they delicous? YOU BETCHA. It’s one of my favorite ingredients to use because it’s so simple but oh so delicious. Where do you see INK Sweets in the future? Are you looking to further expand your business in any way? Anything else we should know about your style? I want anyone who has ever thought, “Maybe I might like something non-traditional. Maybe I would like a cake that isn’t white. I want to do something unexpected & artistic!” to call me. White cakes are pretty, and traditional is obviously great, but my goal is to push people outside of the norm and not be afraid of being a part of something interesting, unique, and DIFFERENT. So I guess being fearless is my style. Don’t be afraid of what others will think and do you. After all, it’s YOUR day!